We talk a lot about the health of marine life in terms of fish, oysters, crabs, and other large organisms that we can observe with the naked eye, but we often look past the microorganisms that, in some cases, can be better indicators of water quality, productivity, and overall ecosystem health. The microorganisms in question often fall under the umbrella term of “plankton”. Directly translated from Greek, the root word “planktos” means wandering and describes how these organisms move through ecosystems. There are many varieties of plankton, including producers (phytoplankton) and predators (zooplankton). Plankton do not all fit into one taxonomic group; there are plankton from each kingdom. Our coastal waters contain species from each, including microcrustaceans like copepods, bacteria like blue-green algae (cyanobacteria), and juvenile life stages of larger animals like oysters and fish. Jellyfish in their most recognizable form, the medusa, are technically plankton, too: they have no locomotion so they just drift. As easy, plentiful prey, plankton often form the base of marine food webs. Unfortunately, having too many phytoplankton is a very real, very dangerous issue in coastal Louisiana where excess nutrients coming down our waterways provide lots of food for phytoplankton. An overgrowth of phytoplankton can cause an algal bloom  and associated hypoxic or dead zone. See our post ‘Stress pt. II: Flooding and Hypoxia’ for more information on how too many producers can decrease the amount of oxygen. 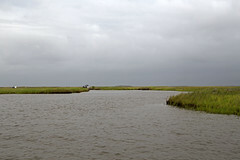 CWPPRA projects help to decrease the area of the Gulf of Mexico dead zone by restoring wetlands. The more wetlands we have in our Mississippi river watershed, the more filtration of excess nutrients we have. Filtration is a major benefit of wetlands and can prevent phytoplankton from accessing these excess nutrients. Hopefully one day nutrient filtration and other pollution reducing practices will allow the gulf to return to its former glory.